If you love Big Maybelle’s Scepter recordings as much as I do you should love these New York/New Jersey sides by Thelma Harper. 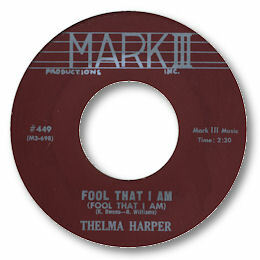 As with Maybelle’s sides a large part of the Mark III tracks’ appeal is the delicious contrast between Thelma’s deep, gritty vocals and the sweet strings and uptown arrangement of the music. Fool That I Am is a latin tinged beat ballad with some really hard singing, but I think I just about prefer It Hurts. This has a slightly better melody and an even more impassioned performance from Ms Harper. Great music. 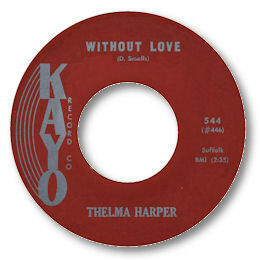 Her Kayo 45 is pretty good too, both sides featuring more first class vocals. And if Oscar Toney's reading of Without Love is the definitive soul version Thelma's heartfelt version comes pretty close thanks to a storming vocal and a gently cooing female chorus. These girls get back to the church for a very lively cover of "My Man" on the flip.